Whoopi Goldberg guest stars this week, as Kurt and Rachel audition for NYADA. Kurt changes his audition song at the last minute and receives high praise from Carmen Tibedeaux (Goldberg) for his rendition of "Not the Boy Next Door." Rachel sings "Don't Rain On My Parade" but forgets the lyrics. Puck must pass his European Geography exam in order to graduate. After hitting on his teacher doesn't go according to plans, he decides to drop out of school. 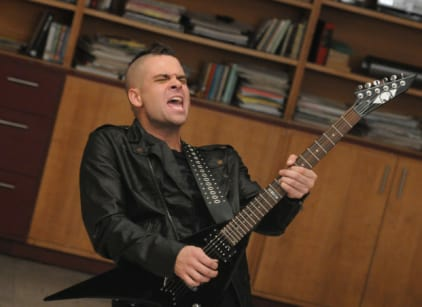 His father comes into town and Puck realizes that graduating from high school is the only way he'll be able to become a better man that his father was. He seeks help from Finn and the rest of the guys in order to prepare for the exam. Coach Washington overhears Santana make a joke about domestic violence and Coach Beiste's black eye. The girls learn that Cooter, Coach Beiste's husband, has hit her.